the deepest river of Nepal (Narayani), Model Tharu Ethnic Community Village, Forests Resorts and Elephant Safari. The sound of the chirping birds and the swishing river. Nepal is the land of extreme diversification. In the space of two hours of drive plain belt, hilly belt, and mountain belt can be reached. This extremely gifted natural land too comprises of the cultural, natural and traditional wonders. The Terai belt of Nepal comprises of the temperate and tropical kind of forests with dozens of wetland. The forests are the home of numerous of endangered species of flora and fauna. If you are searching for the peaceful wildlife adventure yet comprising of the modern facilities then the Chitwan Jungle Safari Tour is the best destination. Chitwan is the top touristic destination in Nepal. The major features of this district of Nepal are Jungle Safari, Crocodile Conservation Area, the deepest river of Nepal (Narayani), Model Tharu Ethnic Community Village, Forests Resorts and Elephant Safari. This place is the home of the Elephant Polo game which has been famous lately throughout the world. The spectacular view of sunset from the banks of Narayani River just above the lush green forests would be an amazing experience. The moderate hot temperature grilled local chicken, mutton or buff along with chilled beer on the bank of Narayani river would be the script from the romantic movie flick. Amidst all these attractions the Jungle Safari Tour is the major highlight of this area. Jungle Safari Tour can be done either on Jeep or on an elephant ride. The dense forests would bring the hilling spines on your skin. The sound of the chirping birds and the swishing river would take you to the enchanted land. The rare view of deer, wild buffaloes, crocodiles, tiger, one horned rhino and other endangered animals would be the astonishing moment in your journey. The small village within the Chitwan National Park would also amaze you. The Army has been protecting along with the locals in terms of the forests and its members’ security. The Safari would be safe and memorable for years to come to you. The magical bathing in Narayani River while sitting on the back of Elephant would be another thrilling experience for you. 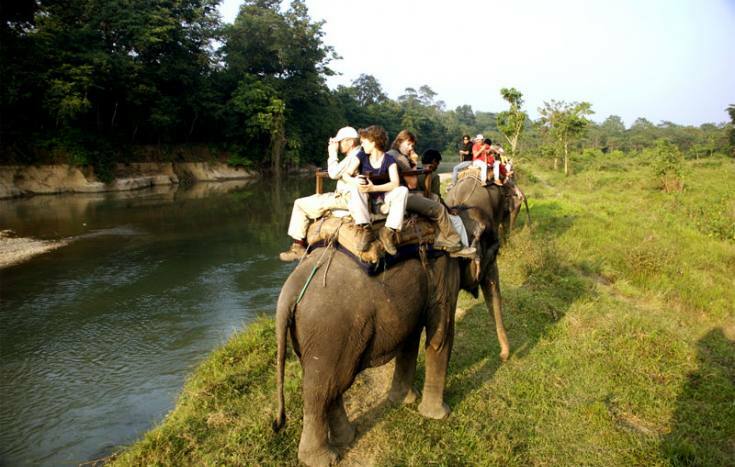 Come witness the wild side of Nepal in the form of Chitwan Jungle Safari Tour. accommodation in Chitwan National Park including all program activities, Elephant Safari, Jungle walk. Day 01Upon arrival at the Kathmandu airport, welcome by our representative & transfer to the hotel. At the hotel briefing about the program by our representative. Day 03Canoe ride along the Rapti River. An excellent opportunity for Bird Watching and for seeing the 2 rare species of crocodiles; the Marsh Mugger and the fish eating Gharial. + Jungle Walk + on the way back one can enjoy the elephant bathing.Elephant Safari.